A South Carolina man who bilked a retired San Diego Catholic priest out of his life savings by informing the victim that he had won $1.6 million and needed to pay up-front taxes of $40,000 was sentenced Thursday to a year in jail and placed on five years probation. Earl Roberts Jr., 31, pleaded guilty in September to theft from an elderly person. Authorities said the defendant sent a phony letter, purportedly from Publishers Clearing House, informing retired priest Michael Ortiz that he had won $1.6 million. The letter went on to say that all the 85-year-old priest had to do to collect the winnings was to pay the taxes of $40,000 up front. The letter, which included a legitimate looking sample check, said Ortiz should respond within 72 hours to an “agent” whose name and phone number were printed on the letter. After the priest contacted the agent, he received a second letter from someone claiming to be his private attorney from Publisher’s Clearing House. Also included was a fake release from the Internal Revenue Service in which Ortiz was agreeing to pay $40,000 up front rather than have his winnings taxed at the rate of 40 percent. The phony sweepstakes letter went on to say that upon paying the $40,000, Ortiz would receive an activation code to cash his $1.6 million check. By the time the priest called his contact to ask for the code, the phone number was disconnected. Roberts was tracked down and arrested because Ortiz contacted the Elder Abuse Unit of the San Diego County District Attorney’s Office once he realized he had been duped. 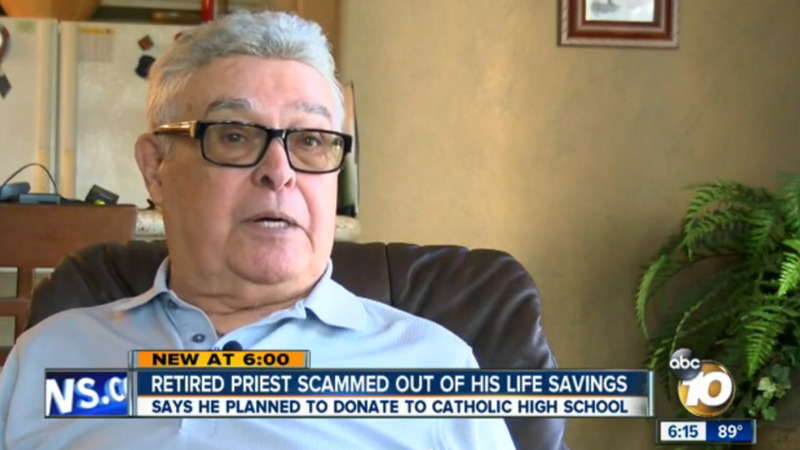 Ortiz, who spent 30 years as an Army chaplain before moving to San Diego to work at Cathedral Catholic High School, said he had dreams of giving half of his winnings to the school and using the rest to pay off his mortgage, car and other expenses. The priest said he had no savings before age 75 because he had taken a vow of poverty, meaning he owned nothing. Ortiz said Roberts and his cohorts were professional and the priest was naive and gullible in falling for the scam. “It is embarrassing, but I think it’s important that people understand there are people out there after your money, especially if you’re elderly like me,” the priest said. Deputy District Attorney Paul Greenwood said investigators got a break in the Ortiz case because the priest was ordered to wire the money and authorities used bank records to track down Roberts.